Summary: Cold. Winter Weather Advisory out for Wednesday 3am 12am to 6pm. 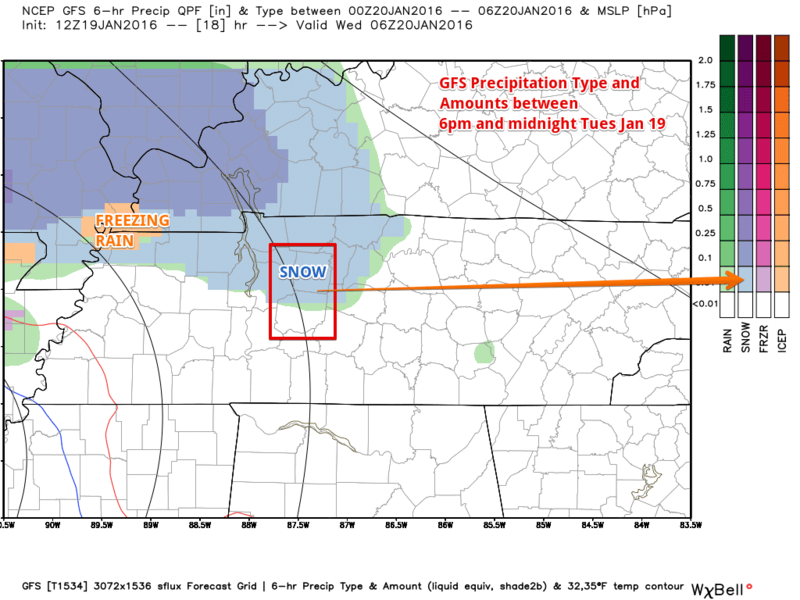 Mixed bag of wintery precipitation expected. Forecasting is hard. Another chance of winter weather for Friday. We are still watching for two chances of winter weather this week. 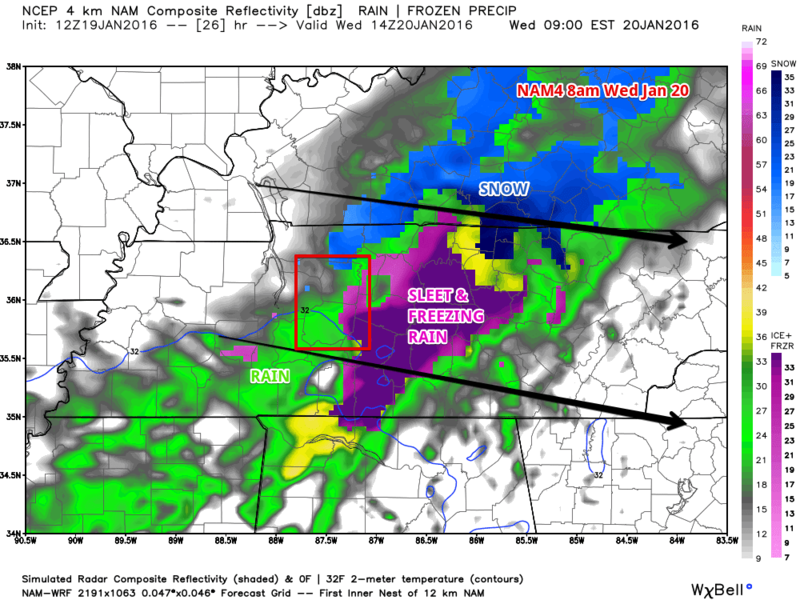 Our focus right now is mainly the event coming in overnight and early tomorrow (Wednesday) morning. We then get another chance of winter weather come Friday. Winter has arrived in Middle Tennessee. It’s going to be one messy rest of the week with snow, ice, freezing rain, sleet, rain, and cold. Today, expect our temperature to never climb above the freezing mark today with a high temperature of 30 degrees. Clouds start to build in ahead of our incoming winter weather maker. Tonight, temperatures fall to about 24 degrees as we start off with mostly cloudy skies then increase to a 50% chance of snow after 3am. Updated Jan 19th, 2:45pm – NWS has reissued the WINTER WEATHER ADVISORY to start at midnight instead of 3am. Our WINTER WEATHER ADVISORY goes into effect at 3am Wednesday morning and goes through 6pm Wednesday evening for all of Middle Tennessee. Here’s the latest wording for the Winter Weather Advisory from NWSNashville. 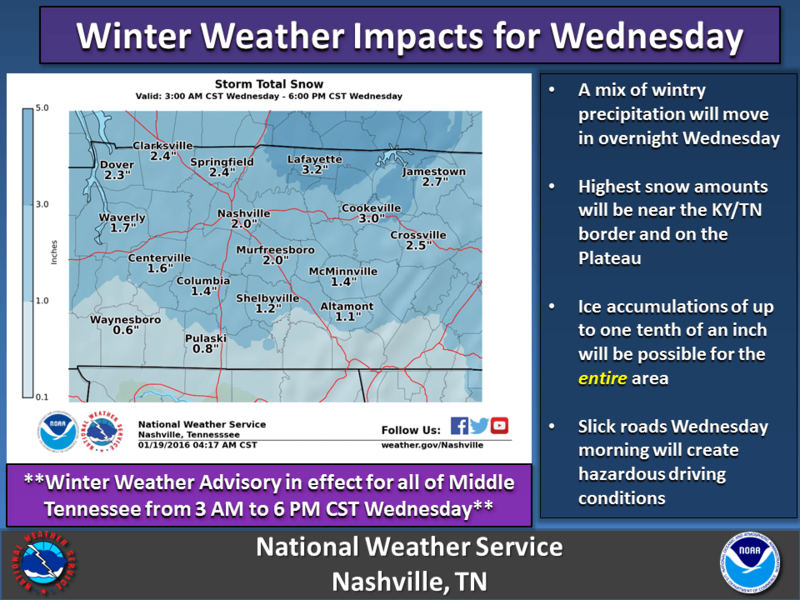 THE NATIONAL WEATHER SERVICE IN NASHVILLE HAS ISSUED A WINTER WEATHER ADVISORY FOR SNOW AND ICE...WHICH IS IN EFFECT FROM 3 AM TO 6 PM CST WEDNESDAY. * TIMING...3 AM CST WEDNESDAY UNTIL 6 PM CST THURSDAY. * MAIN IMPACT AREA...1 TO 3 INCHES OF SNOW AS WELL AS UP TO ONE TENTH OF AN INCH OF ICE FOR AREAS ALONG AND NORTH OF I-40 AND THE CUMBERLAND PLATEAU. PREPARE FOR MAJOR TRAVEL IMPACTS. 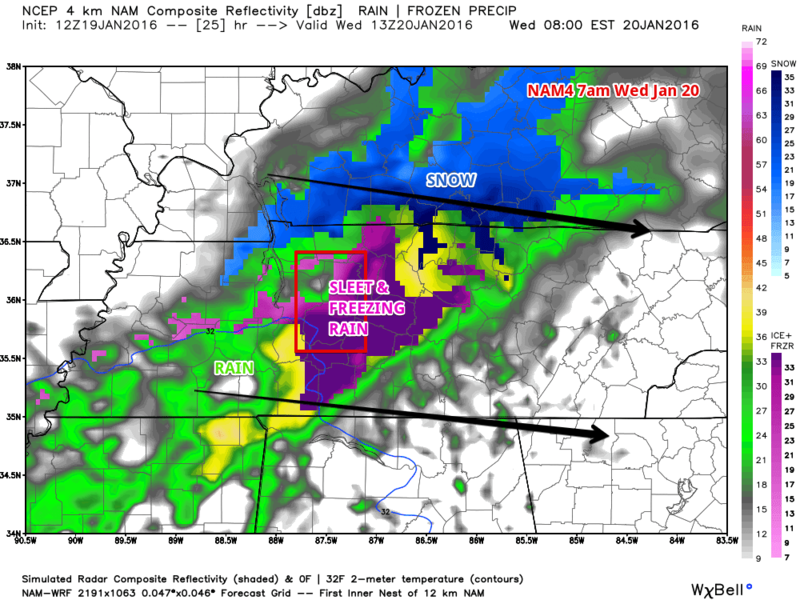 * OTHER IMPACT AREAS...UP TO INCH OF SNOW AND A TENTH OF AN INCH OF ICE FOR THE REST OF MIDDLE TENNESSEE. MODERATE TRAVEL IMPACTS ARE EXPECTED. Our WINTER WEATHER ADVISORY goes into effect at midnight tonight and ends at 6pm Wednesday evening for all of Middle Tennessee. Here’s the latest wording from Winter Weather Advisory from NWSNashville. * TIMING...12 AM UNTIL 6 PM CST WEDNESDAY. * ALONG AND NORTH OF I-40...SNOW ACCUMULATIONS OF 1 TO 3 INCHES...LOCALLY UP TO 4 INCHES NEAR THE KENTUCKY BORDER. ICE ACCUMULATIONS UP TO ONE TENTH OF AN INCH. * SOUTH OF I-40...SNOW ACCUMULATIONS RANGING FROM A DUSTING NEAR THE ALABAMA BORDER UP TO 1 TO 2 INCHES NEAR I-40. ICE ACCUMULATIONS AROUND A TENTH OF AN INCH. * IMPACTS...SNOW AND ICE ACCUMULATIONS ON ROADS AND BRIDGES WILL CREATE VERY HAZARDOUS TRAVEL CONDITIONS...ESPECIALLY ALONG AND NORTH OF I-40. 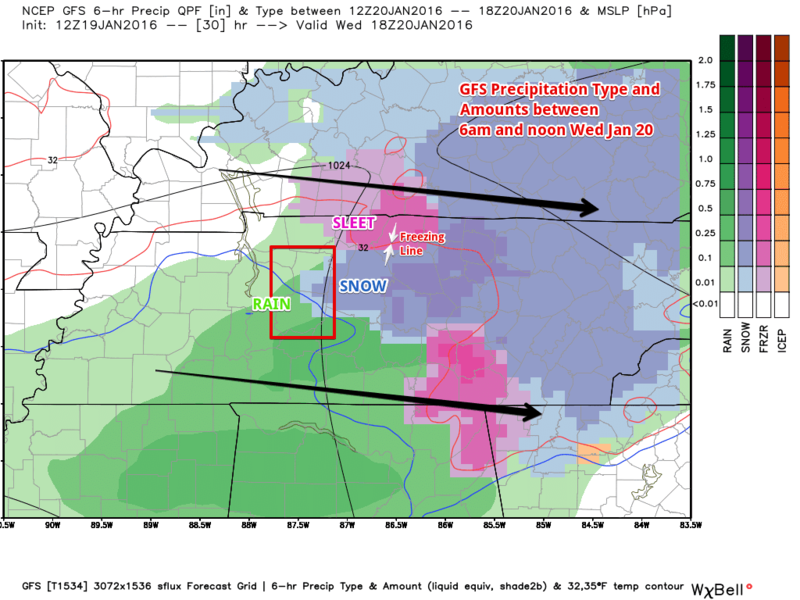 Wednesday morning is when our winter precipitation starts. As described above, our snow chances increase to 50% after 3am Wednesday morning. The high temperature expected for Wednesday is 34 degrees, just two degrees above freezing. Keep this in mind while reading the rest of this post. When this system comes in, we expect it to start as snow and transition into sleet, then freezing rain, then rain as we go into the afternoon hours as we start reaching closer to that just above freezing high temperature of 34 degrees. Why are we getting a mix bag of precipitation? There will be a warm layer of air expected to be in place when this system moves in. With that warm layer of air, snow falling from the sky through this warm air changes that snow into either freezing rain or sleet. If there is more warm air in place, the precip falls as really cold rain that freezes on contact when it hits a frozen ground. If there is less warm air in place, the snow falls through the warm air melting it, then hits the cold air at the ground and has a chance to refreeze into sleet before hitting the ground. 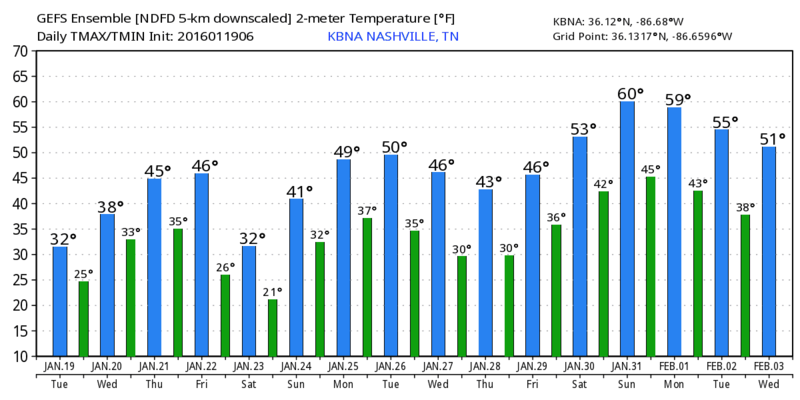 Models aren’t 100% sure how much warm air there is going to be. Early morning Wednesday morning we will likely start off with some snow. 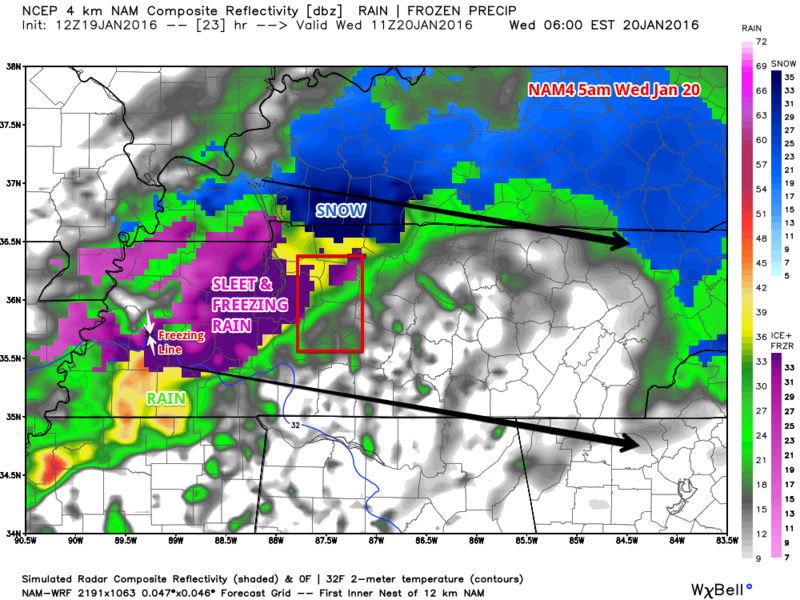 Here’s what each model has for us (note that the GFS is in 6 hour blocks where the NAM4 is in 1 hour blocks). GFS Between 6pm Tuesday and midnight Wednesday. 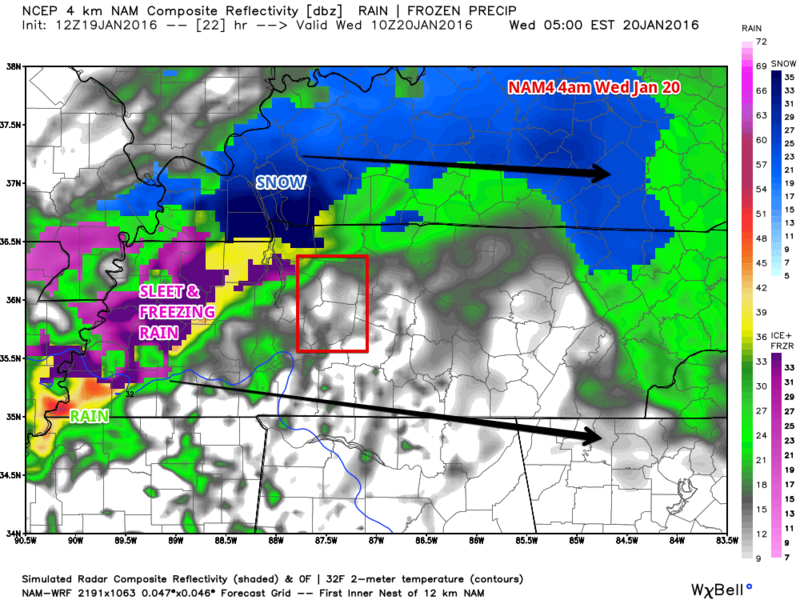 GFS Between midnight and 6am Wednesday. It’s important to note that the timing isn’t exact. 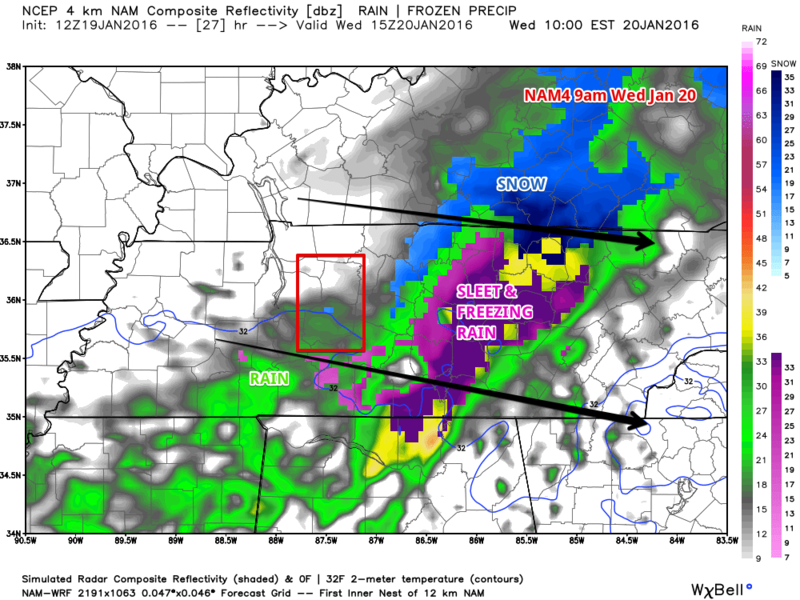 While it looks like it should start for Hickman County at around 5am according to NAM4, it could come in faster or wait later. This is why our Winter Weather Advisory is from 3am 12am to 6pm. Updated Jan 19th, 2:45pm – The Winter Weather Advisory is from 12am to 6pm Wednesday. Different models are pointing to different amounts of snow and ice accumulations. 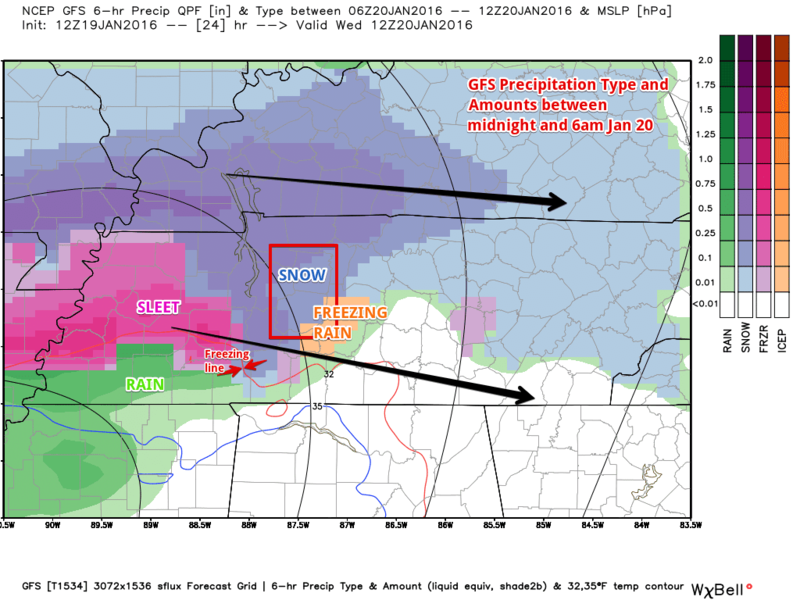 NWSNashville has released this graphic into their thinking on accumulations, which is the one we are going with. It’s important to note that we are expected to get both snow and ice during this event. The above is snow totals, which show Hickman County getting roughly 1.5 inches. 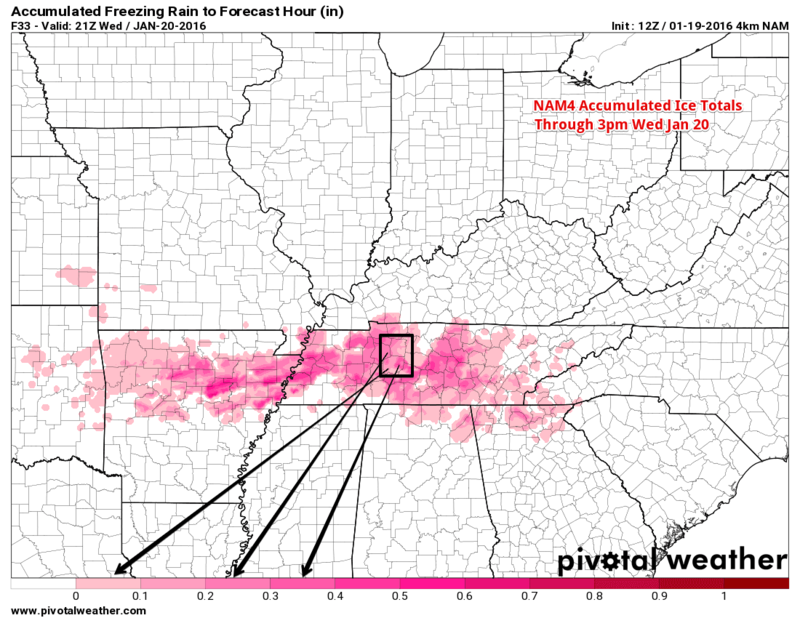 Ice accumulations could be between .1 inch and .3 inches for Hickman County. 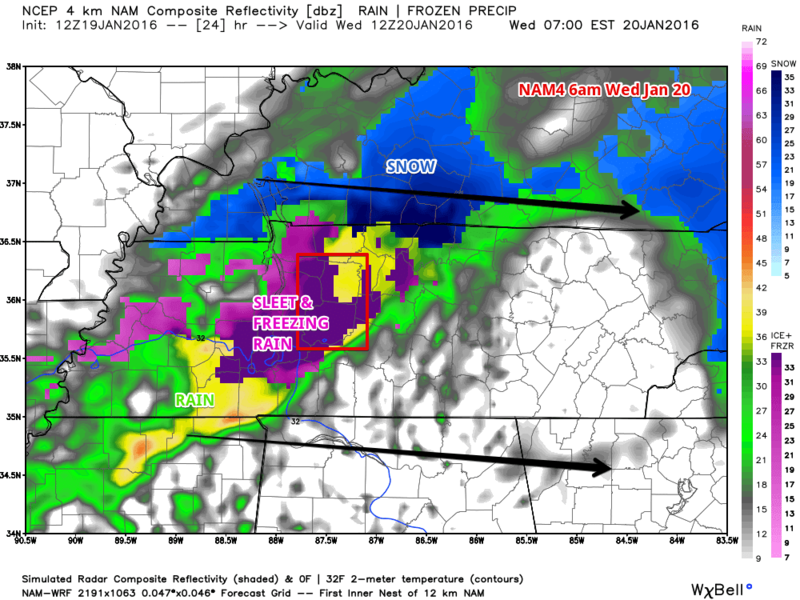 NWSNashville is estimating we will see .1 inches of ice accumulations. Important Takeaway: Winter weather is very hard to predict. What makes it even harder is that we are right on that dividing line of freezing air and not freezing air (indicated in the modes as the red or blue line marked). This uncertainty means we could see all types of winter precipitation. This is likely to make a mess of travel Wednesday morning through afternoon. Temperatures get just above freezing so it will help melt things away Wednesday. We’ve been focused on this winter weather system for Wednesday, but we have yet another one coming on Friday. Right now Thursday looks wet, but above freezing. However, that system changes over to snow on Friday, and models are pointing to some accumulations for Friday. It also appears to be a rain change over quickly to snow event, but lots could change. Our local NWS is indicating that we could see yet another winter weather system early next week, but that is too far out to say with much certainty. As you can see in the extended temperature forecast below, after these couple of systems (the dips in high temps you see in that chart), things start to warm up to above average temperatures.